We did a lot of work on this house, put the wrap-around porch on, even put in a bath room (yes, hard to belive we actually had an outhouse for some time in the late 80's). We had close to 100 head of cattle and farmed about 1100 acres.... those were the days. My oldest daughter Jenny celebrated her one year birthday on the farm. 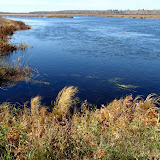 20 lakes, several rivers and streams cover an area of 1600 sq km. You would need some serious time to cover all corners of the park. Liz and Anders at Matheson Lake, in Meadow Lake Provincial Park. Meadow Lake Provincial Park is a great place to kick back at some of the best beaches in Saskatchewan. Boat or windsurf at a new spot every day, or take a quiet paddle down a rugged shoreline for a close-up view of loons, ducks or maybe even a browsing moose or a great blue heron. The park has lots of room for campers with 12 campgrounds and 928 campsites. Of those, over 300 have electric services. There are 3 stores in the park, mini-golf, horse back riding and more. If you are visiting Saskatchewan, add this park to your list of places to stay. More information is available on line.